Here’s something to think about, can you really be a vegan. Most people don’t realize that dairy cows provide us with an array of other products we use every day. For example, when I was at Cal Poly we used animal fat to make soap. Crazy, but most people don’t really even know what is in products they use every day. 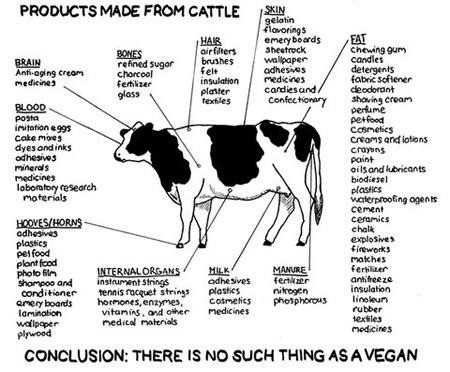 I don’t know how accurate this diagram is, but I know that many of these products are actually made from animals. Some products though I question, I guess some more research is in order. Click here to go to the website where I got this.